Last week I did a keynote at the National Conference on Technology-Enhanced Learning at the National University of Singapore. One of the other keynotes was Michelene Chi from Arizona State University. She gave a really interested talk on the ICAP framework they have developed. ICAP stands for Interactive, Constructive, Active, and Passive. It defines cognitive engagement activities on the basis of students’ overt behaviours and proposes that engagement behaviours can be categorized and differentiated into one of four modes: Interactive, Constructive, Active, and Passive. The ICAP hypothesis predicts that as students become more engaged with the learning materials, from passive to active to constructive to interactive, their learning will increase. A useful paper on the framework is available online. Her talk was entitled: ‘Implications of ICAP: a theory of student engagement for classroom and technology-enhanced practices.’ This blog post summarises her talk. 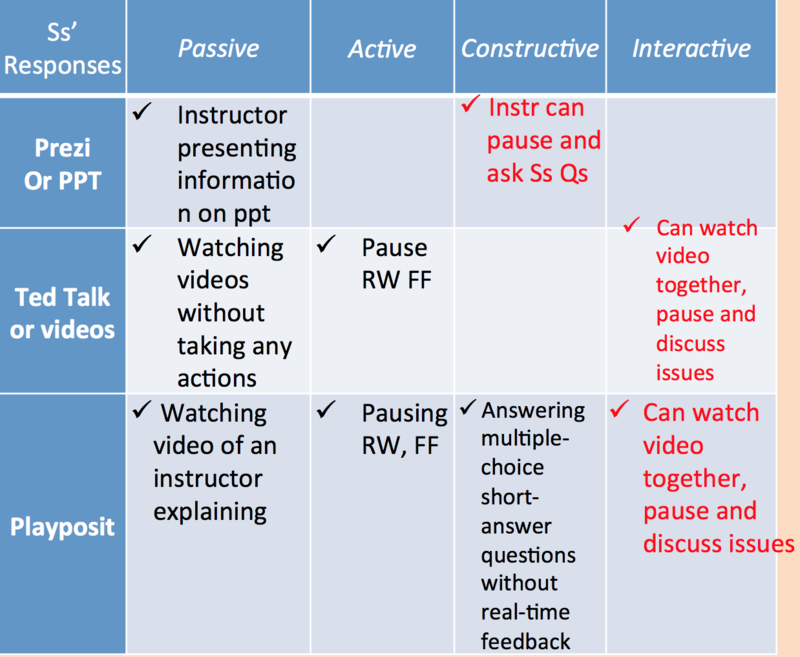 Attending mode (or passive mode): Students are paying attention, oriented toward & receiving instruction. But they are not doing anything else overtly, They are not producing anything. Examples: listening to lectures without taking notes, watching videos, observing a demonstration, reading a worked-out example. Manipulating behaviour (active mode): Ss are paying attention and physically manipulating the instructional materials, but not adding any new information. Examples: copying the solution from the board, underlining the important sentences, agreeing in dialogue, selection an option, moving a slider, measuring quantities, recording amount, pointing and gesturing, repeating definitions. Outputs include text markups of a subset of sentences etc. Generating behaviours (constructive mode): Ss are producing some additional information that may contain (incidentally or intentionally) small (or large) pieces of knowledge that is not in the instructional materials. -Constructive does not mean that Ss are discovering knowledge/principles novel to the domain! We only mean that Ss are adding minute pieces of knowledge beyond what was presented in the instructional materials, literally. Cumulatively, they end up constructing an understanding. Examples: drawing, explaining, posting, taking in one’s words, providing, comparing and contrasting, evaluating, predicting, reflecting, monitoring. Outputs: concept maps, explanations, questions, notes not duplicate, justifications, similarities and differences, reviews, outcomes, insights of one’s own understanding. Collaborative behaviour (interactive mode): Behaviour of working with a peer (commonly through dialogs): Taking turns, sharing attention. Outputs must be dialog pattern of each person generating and building on the other person’s contributions in a mutually-and reciprocally co-generative or co-constructive way. Sometimes this has been referred to as transactive dialogues. Examples: explaining jointly, debating with a peer, discussing. Outputs: elaborated peer’s explanation, challenge peer’s claim, provide example for peer’s justification, formulate peer’s point. There are four knowledge processes: storing (new information), activating (relating to prior knowledge), linking (new information with prior knowledge) and inferring (a new piece of information). 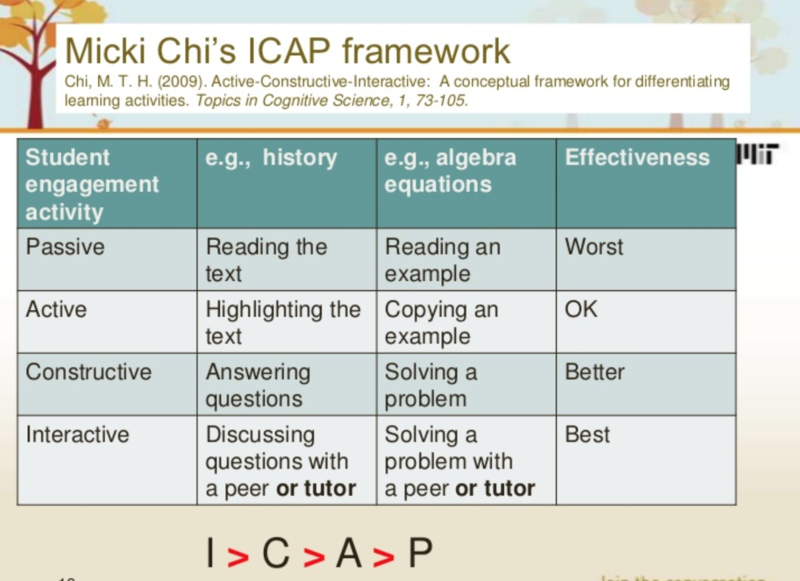 She then outlined ways in which the ICAP framework can be used to improve: lecturing, leading a discussion, designing worksheet activities, enabling co-constructive collaboration and using digital tools. Lectures can be improved by asking students to generate new knowledge or asking them about what is unclear to them. In terms of a discussion, you can summarise what the students said and ask them if that is what they meant, or ask them to connect the ideas that have been raised, or ask them to critique another students viewpoint. In terms of designing activities, you can show them how a teacher-generated a worksheet. She argued that verbs were important. Some do not ask the students to generate new information, such as add, identify, choose, circle, copy etc. 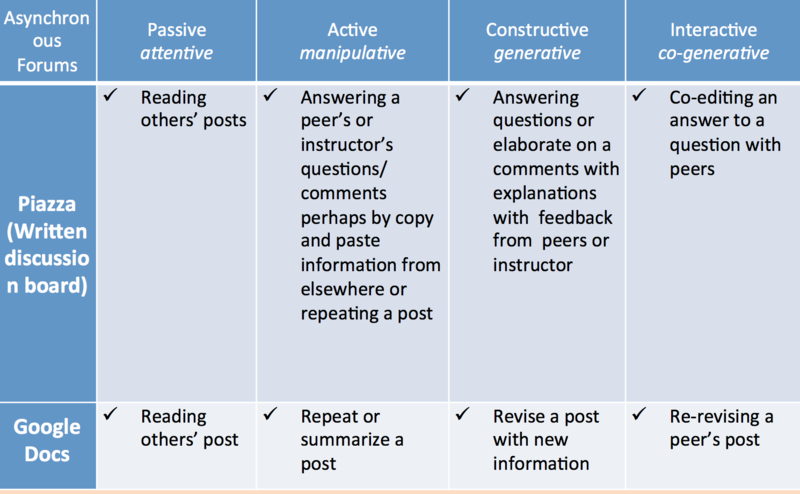 Others are generative/constructive verbs such as ask questions, brainstorm, connect, graph. A small subset are collaborative/interactive verbs such as agree upon, debate, share. She then provided examples of how digital tools can be mapped to the ICAP framework, below two examples are provided: tools for presentation and tools for discussion. This entry was posted on Thursday, November 30th, 2017 at 1:00 am	and is filed under General. You can follow any responses to this entry through the RSS 2.0 feed. You can leave a response, or trackback from your own site.